A group of warriors aged 40-65 years old gathered in Vermont to acknowledge and celebrate the first Rites of Passage for the stages of life. Celebrating 20 and 10 year intervals, this program acknowledges the various phases of life with celebration and reflection. 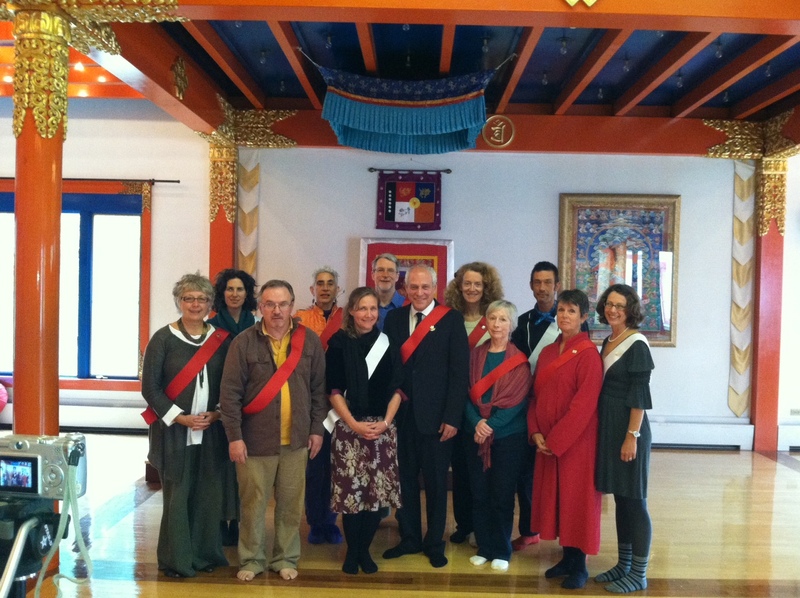 Led by Acharya Mitchell Levy and assisted by Heidi Mecklenburg we journeyed through two and a half days of gathering, reflecting and vowing. Accompanied by the dralas from the elements of earth, air, water and fire that saturate Karme Choling, particularly with colorful peak autumn leaves, the warriors walked the land and had several powerful land-based experiences. We felt, tasted, touched, and smelled the world and the four elements. We contemplated transitions and the distinction between the emotions of loss and being lost that can accompany change. A touching discussion was held on groundlessness and letting go of reference points as we age. We meditated, practiced, contemplated, wrote letters, marked and celebrated together. Huddled around a fire sacred moments were shared, stories told, and rites begun. We read a liturgy from the Sakyong, called the “Fortress of Goodness” and wrote letters of regret and aspiration, which were used in the ceremony on the final day of the Rites of Passage. Together we read a Homage and Statement written by the Sakyong that proclaimed the passage of time, our gratefulness, and awareness of this precious and fleeting life. To read a group poem written by the participants, entitled “Longing”, please click here. Shambhala Rites of Passage offer the opportunity for warriors to connect with inherent wakefulness and awaken to whatever stage of life we are on in our journey and to “humbly bow to this glorious and monumental day of my life” (Sakyong Mipham Rinpoche). Andrea Sherman is Chair of the Working Group on Aging for Shambhala, Co-Leads the Conversations on Aging Group at New York Shambhala, is a graduate of NY Buddhist Contemplative Care Program, and has been a Gerontologist for more than 30 years. To read more articles in this Column, please click here. I’m so happy to see that this is happening! I went through Rights of Passage for 8 year olds and Rights of Warriorship for 16 year olds, and these programs enriched my life immeasurably. It is good to feel like growing up and growing older has meaning, and to explore what new kinds of dignity and challenges each life stage brings. Thank you for your comment! We are happy that there are RItes of Passage in Shambhala for all ages and abilities and look forward to hearing from you when you attend these. It will be an interesting point of view to hear from someone like you who has experienced these rites at different stages in life. Hopefully they will be offered at different centers by a variety of teachers. Thanks again! What a great idea and event. Congratulations to all participants of “Historic Rites of Passage”.